When I shared the Potato Pancake with Apple Sauce Recipe two weeks ago I promised you to introduce you to its savory brother. I am in love but I am willing to share. That’s how good a person I am. Good yet slightly demented as it turned out. After giving this traditional European recipe a sweet and healthy makeover of course my savory tooth felt neglected. That had to be rectified! As the potato pancakes you get here are usually pretty bland I wanted my savory version to have a good taste on their own even if I had every intention to pair them with a saucy dish. Obviously cheese seemed to be a good option. Parmesan Cheese! 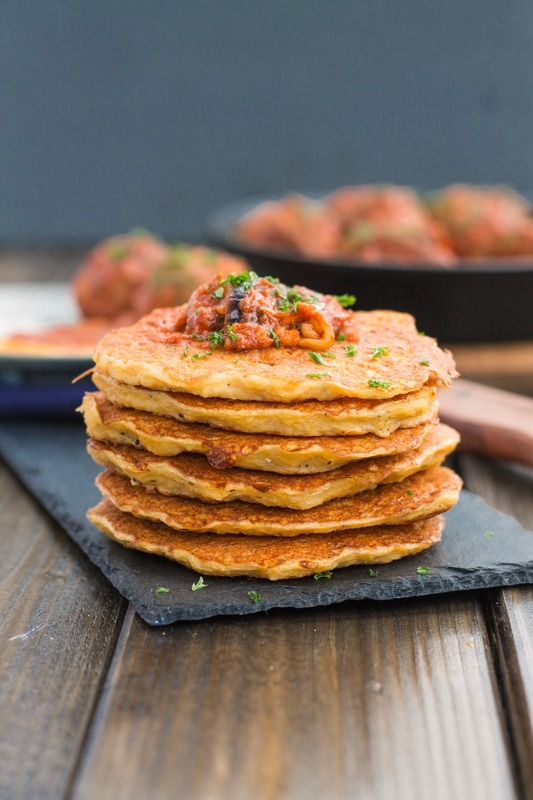 Putting together Parmesan and these Potato Pancakes I immediately had the image of my Parmesan Marinara Meatballs in mind as well .And then it hit me. In a variation I have eaten this dish before. And when I told you there was no back story to this Parmesan Marinara Meatballs recipe I need to apologize because I told you a lie. Okay maybe it’s not really a lie when you are not aware that you’re lying but I definitely didn’t tell you the truth and I can not at all believe I forgot about that evening! On a second thought I kinda have an idea why I have slightly blurry memories about that evening but that shall not be part of today’s story. The first time Stefan and I visited New York we found this amazing Bar in East Village. They had tables outside on the sidewalk, played catchy music and served a wicked Sangria (← that’s what I am talking about) along the best tapas I have ever eaten. One of them was Marinara Meatballs with cheese and another one was a cheese pancake. My personal heaven! Yet so much for being original. Anyways I feel no guilt about not being original when I make these dishes. Epic food creations > being original. Anytime. 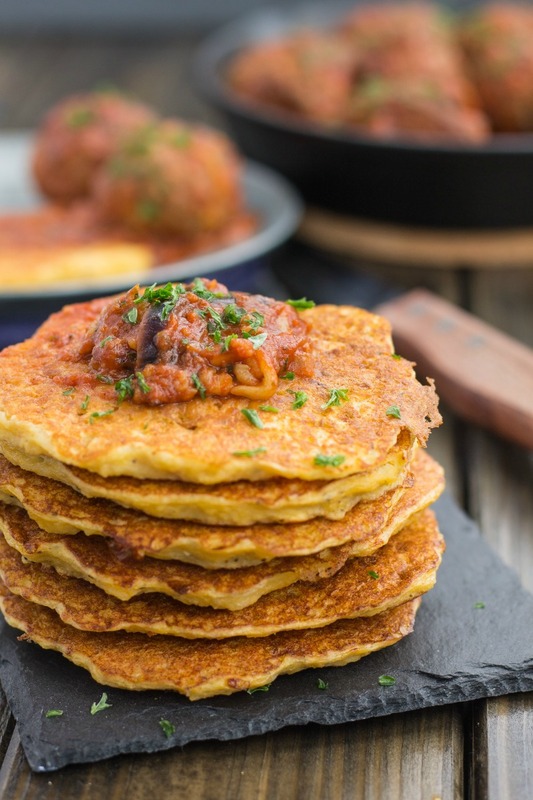 These Parmesan Potato Pancake are crisp on the outside and tender on the inside. While they are pretty tasty on their own they are a great vehicle for a saucy dish. 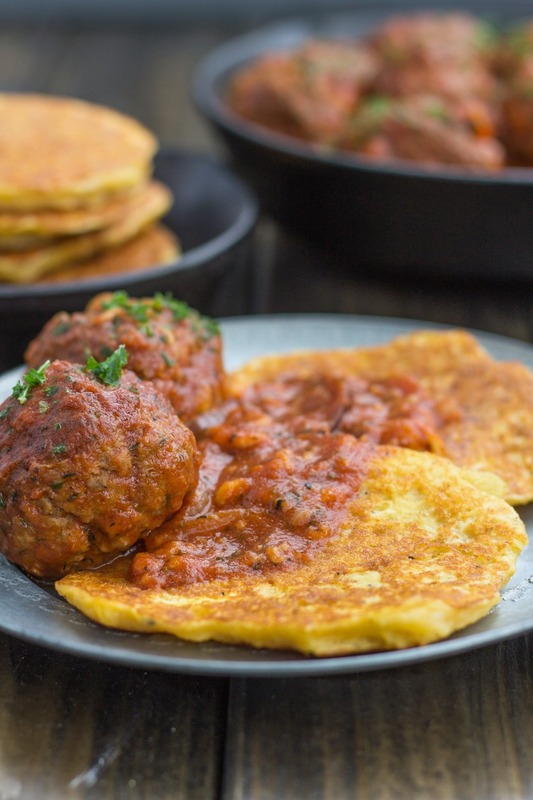 So I am not exaggerating when I say that these Parmesan Potato Pancake are the perfect companion for a meatball dish. Hey, when they do it in NYC…. The Potato Pancake is another recipe that brings travelling memories back. Even the ones that seemed to be… let’s say sleeping. I love when I can combine food and travel – two of my favorite things in the world. And speaking about travelling, I have every intention to book the last accomodations for our trip and finalize our itinerary this weekend. Maybe I also need to whip up this dish in an attempt to make up for New York not being part of this year’s itinerary. These look absolutely delicious, Juli! I need to make these and smother them with my nomato sauce! Omg what is nomato sauce? Promise me to snapchat the hell out of this trip! I have serious travel withdrawal symptoms!!! Screw originality, especially when this is the result. Be still my potato and cheese loving heart. These look and sound fantastic. Plus I love how few ingredients are involved. Yep, sometimes simple is best.